(Phys.org) —At Northrop Grumman Aerospace Systems facilities in Redondo Beach, California, integration and test technicians work on a mock-up of the James Webb Space Telescope spacecraft bus, testing the assembly of its parts. 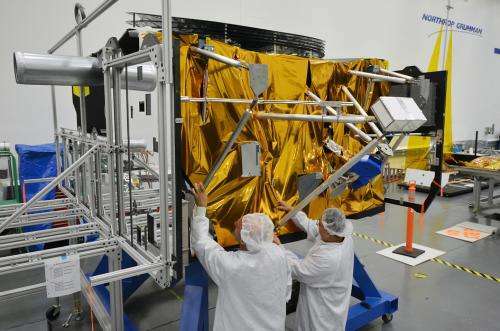 The spacecraft bus will provide the necessary support functions for the operation of the Webb Observatory after it is launched into space in 2018. The Electrical Power Subsystem or EPS provides the power needed to operate the whole observatory. The EPS converts sunlight shining on the solar array panels into the power needed to operate the other subsystems in the bus as well as the Science Instrument Payload. The Attitude Control Subsystem senses the orientation of the Observatory, maintains the Observatory in a stable orbit, and provides the coarse pointing of the Observatory to the area in the sky that the Science Instruments want to observe. The Communication Subsystem is the ears and mouth for the Observatory. The system receives instructions (commands) from the Operations Control Center and sends (transmits) the science and status data to the OCC. The Propulsion System contains the fuel tanks and the rockets that, when directed by the Attitude Control System, are fired to maintain orbit. The Thermal Control Subsystem maintains the operating temperature of the spacecraft bus.